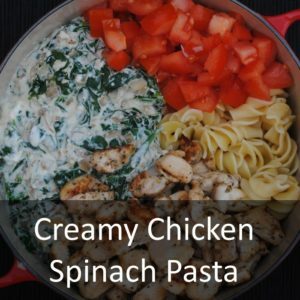 Having a happy tummy means that I am happy too and the best way for me to have a happy tummy is to make sure that I am eating enough fruit and vegetables, as well as eating wholegrains and this Creamy Chicken Spinach Pasta includes all three. The lovely people at Activia are on a mission to help people enjoy the little moments in life by having a #HappyTummy and that is something I can definitely get on board with. You can find out more about it over on their Facebook page. Having a happy tummy means I am able to get the most out of my day and tick everything off my to-do list. It is amazing how quickly I can feel really sluggish when I am not eating enough fibre, but it is also amazing how quick that can turn around and how much better I can feel when including more of it in my diet. One of the ways I do that is by eating vegetables with every meal. I am focusing on working out to boost my mood at the moment and that is really hard to do with an unhappy tummy, so increasing my fibre is something I am focusing on a lot at the moment. We only eat wholegrains and we feel so much better for it. Activia have brought out a new product called Activia Fibre, that not only contains 5 live cultures, but also has a topper that contains wheat bran fibre, making it a great way to get some extra fibre in to your diet, especially if you are short on time. Take a look at my happy tummy recipe that is full of vegetables and wholegrains. 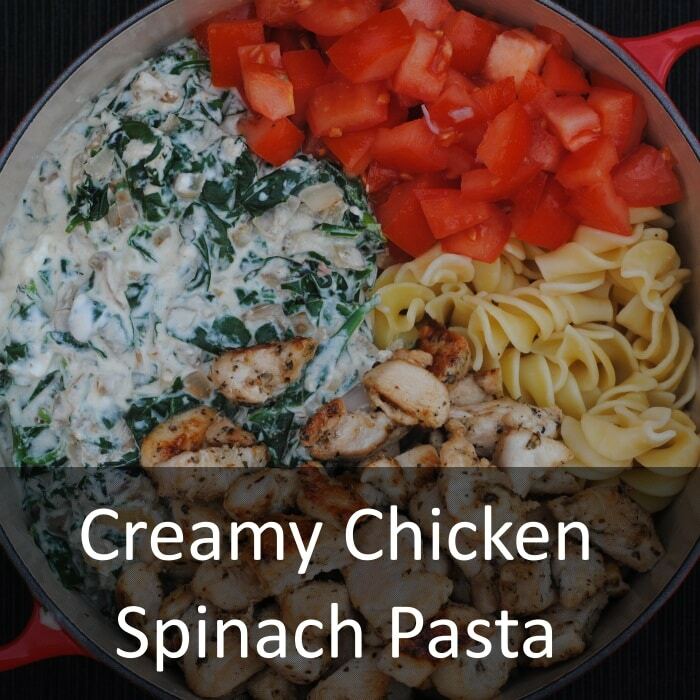 To make sure that I am eating enough fruit and vegetables, as well as eating wholegrains and this Creamy Chicken Spinach Pasta includes all three. Put the chicken under the grill and cook for 20-30 minutes, until the chicken is cooked through. Cut in to chunks and set aside. Heat a little oil in a large pan and add the shallots and garlic and cook for 4 minutes. 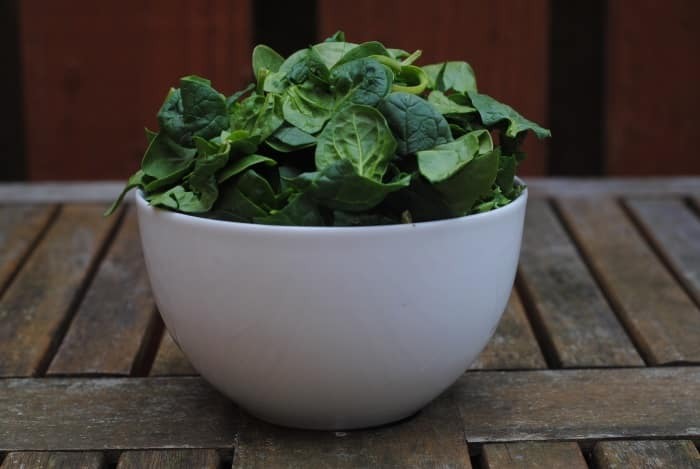 Add the spinach, cream cheese, milk, yoghurt and salt and pepper and heat very gently for 2 minutes. 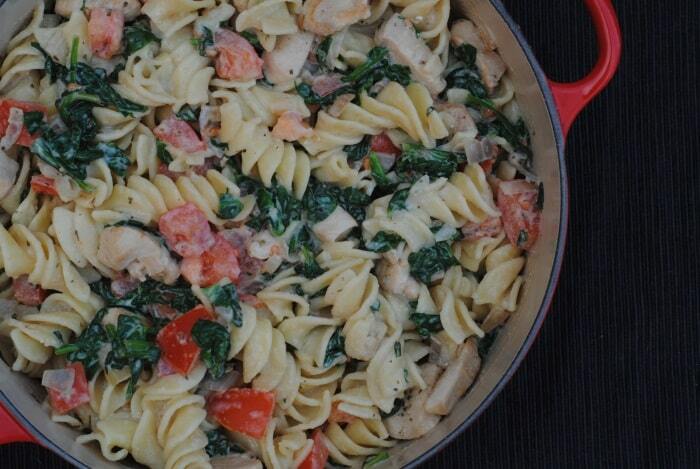 Drain the pasta and add to the spinach mix and add the chicken and tomatoes too. Stir well and put in a preheated oven at 200C for 20 minutes. Do you have a favourite pasta dish? Looks so fresh and delicious. And healthy, even though it’s creamy! I’d love to try this with salmon, since I love fish too. 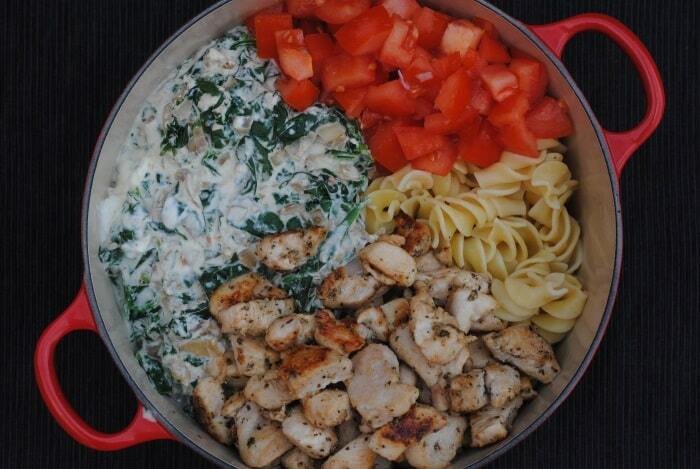 This pasta looks wonderful! Love that you get extra protein from the Greek Yogurt. My favourite pasta dish has to be spaghetti Carbonara – however right now with the tomatoes so ripe and sweet it’s the truck driver’s pasta where you just stir the hot pasta into raw toms with some herbs and garlic – sublime. Ooh this sounds like proper, healthier, comfort food! I might have a veggie loaded pizza in the oven just now but I’m craving pasta after this post! I would love to cook with Activia especially with such a healthy but yummy dish. I have to confess I am not a fan of creamy pasta, however, having said that an read the ingredients in your recipe I think my arm could definitely be twisted. I love the use of yoghurt. I’m using it more and more in recipes too. 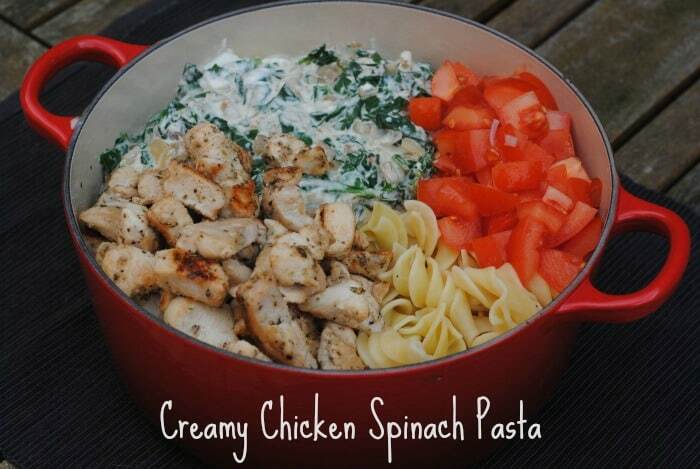 YUM, I love adding yoghurt to creamy dishes to lighten them up a little and I am obsessed with spinach in pasta. Pasta is my go to meal if I am not in the mood for too much fuss. My absolute favourite is just with olive oil, garlic and chill but I do love a cream laden,bacon lardon feast too. I’m not a big pasta fan but I like the sound of the toppings and sauce – probably something I could eat with a sweet potato hehe! Exactly the kind of recipe I really like, looks very tasty!